Israeli soldiers firing guns on one side... Palestinian youths throwing stones on the other. Friday's scenes were nothing new in the Middle East but, after President Donald Trump's decision to recognise Jerusalem as Israel's capital, fresh blood has been spilt. On a so-called 'Day of Rage', at least two Palestinians were killed and, according to Palestinian medics, more than 200 injured in clashes with Israeli troops in the West Bank and Gaza. 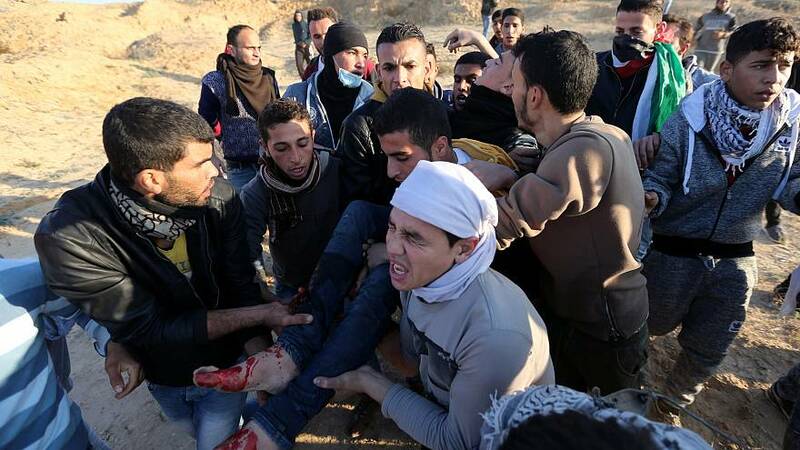 Israeli soldiers shot dead a Palestinian man near the Gaza border, the first confirmed death in two days of unrest. A second person later died of their wounds, a Gaza hospital official said. The powerful Palestinian Islamist group Hamas had called for a new uprising against Israel. It is not yet clear whether Friday's unrest marks the start of an intifada. As the injured were evacuated to hospital, rockets were being fired from Gaza to Israel. The military said one rocket hit the Israeli town of Sderot. No casualties were reported. Israel's military said its aircraft responded by bombing militant targets in Gaza, which Hamas controls. The Palestinian Health Ministry said at least 25 people were wounded in those strikes, including six children.